I built a levitator table to show how radial expansion of fluid is necessary to induce lift. High velocity fluid, by itself does not induce lift. 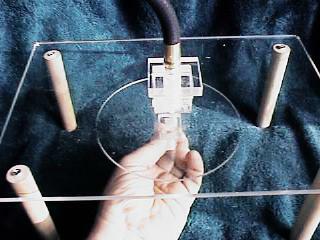 I fabricated several disks with channels to entrain the air in various patterns. According to current misapplications of the Bernoulli Principle, all disks should stick to the Levitator table by the fast air principle. However, only the disks that allow radial expansion of the air stick to the table. This indicates that fluid velocity does not explain lift and that the levitation has to do with Radial Momentum. My Levitator Table, showing flow and pressure instrumentation. My levitator table consists of acrylic plastic. It has an orifice in the center of the table and a plenum above the orifice. 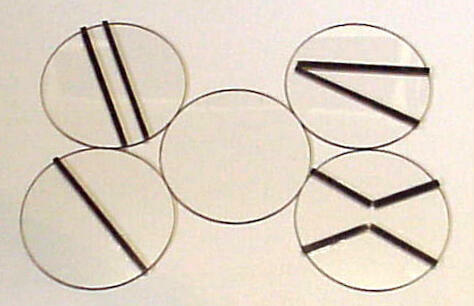 The test plates, also from acrylic plastic, feature air channels of differing shapes, one of which enforces parallel air flow. All the disks stick to the table except that one. 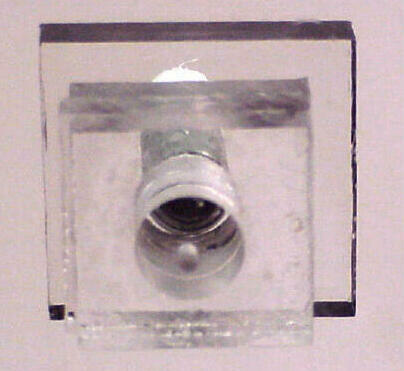 Air enters through the hose and exits through the orifice. With the air supply on, air flows in from the top and out through the orifice. I bring various plates up under the orifice to determine if they adhere to the underside of the table. Despite the force of the air pressing down on the center of the plates, some plates actually adhere to the underside of the table, indicating a reduced pressure effect between the table and the plates. Air flows from an air compressor, through an orifice in the table and onto a plenum above the plate below. The air then flows into the gap between the table and the plate. On most of the plates, the flow expands radially and, due to momentum, keeps expanding until friction reduces the velocity to zero. As the air expands, it loses pressure and the plate sticks to the table. Note: In cases where the plate adheres, application of an additional downward force to the plate results in an increase in the gap size, an increase in airflow and the induction of additional upward force to balance the increased weight. I use this relationship as a way to gain numerical data in order to validate a model based on the Radial Momentum. The flat plate adheres to the underside of the table. The hourglass plate adheres, no matter which region is under the jet. The V plate adheres, no matter which region is under the jet. The split plate adheres, no matter which region is under the jet. The parallel channel plate adheres, when either outside region is under the jet. It does not adhere when the jet is between the parallel guides. Result: The only configuration that fails to adhere to the table is the parallel channel plate when the central parallel channel is under the jet. This is also the only configuration that does not allow for radial expansion of the air, so there is no Radial Momentum. The author constructs the channels by gluing plastic strips onto the face of the disks. 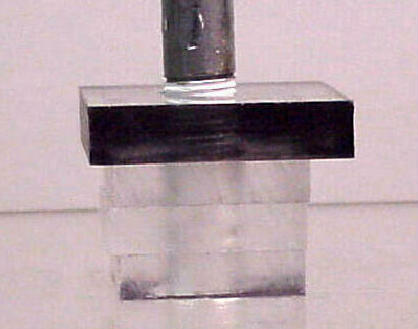 The hourglass shape (shown above) adheres to the table, no matter which region is below the orifice. Only the disk with a parallel channel fails to adhere. The air plenum, a chamber on top of the table. View of the plenum from below the table. The author uses holes 1/16 inch and 1/8 inch in diameter in these tests. A standard hardware store compressor furnishes the air, at pressures up to about 60 psi. Note: I repeated the levitator tests using water instead of air as the fluid. The results were even more pronounced than those with air. The force holding a plate with a surface area of a few square inches, to a table with an orifice of 1/8", fed with normal domestic water pressure can be several pounds. In addition, a small white cavitation ring, indicating very low pressure, forms around the input orifice in what I call the Active Region. As with air, all channel patterns adhere except ones that entrain parallel, non-radial flow.